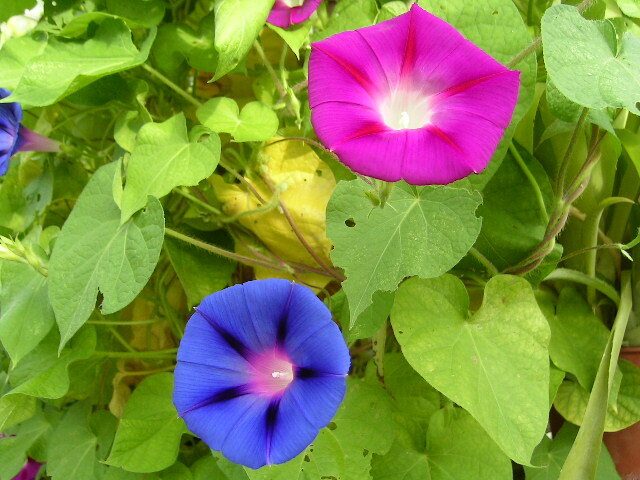 Ipomoea purpurea is an annual vine, to 5 m long, stems hairy. 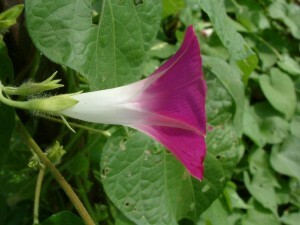 Flowers large, 4-6 cm, purple to white, funnel-shaped; petals fused, sepals fused, lobes pointed; blooming July-Sept. Self-pollinating but mostly outcrossing (Motten and Antonovics 1992). Ipomoea purpurea.calyx.louis-M Landry.calphotos.berkeley.edu (Accessed 6/20150. Fruit dry, hollow, splitting open to release seeds. Habitat: Ephemeral in open areas. Escaped from cultivation.